Six new councillors, including two from the Electoral Action of Poles in Lithuania, will begin their service for the City Council of Vilnius. They will replace the former councillors who have been elected to the Seimas. During the Wednesday session of the council the Mayor of Vilnius, Artūras Zuokas, will officially admit two EAPL members, Waldemar Szełkowski and Jan Tomaszewicz, to the City Council. They will take an oath, which will be received by Jonas Udris, a member of the Main Election Committee. 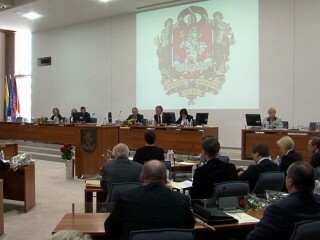 The new councillors will replace Józef Kwiatkowski and Wanda Krawczonok, who have just begun their work in the Seimas. Together with the Poles, a conservative Evaldas Maceika and a social-democrat Rimantas Vaitkus will also be admitted to the council. Two remaining newly-elected councillors, who represent the Labour Party, will take their oaths on the next session of the City Council of Vilnius. Waldemar Szełkowski is a historian, a teacher in Józef Ignacy Kraszewski High School in Vilnius, a member of the Association of Poles in Lithuania, and a member of the Association of Social Initiatives. Jan Tomaszewicz is an adviser to the Mayor of Vilnius and he works in the administration of the Vilnius City Council. In years 2007-2011 he also served as a city councillor, being a member of the Order and Justice party. Tłumaczenie Natalia Błędowska w ramach praktyk w Europejskiej Fundacji Praw Człowieka, www.efhr.eu. Translated by Natalia Błędowska the framework of a traineeship programme of the European Foundation of Human Rights, www.efhr.eu.